McCartney was born in Musselburgh in 1954 and served his apprenticeship at The Hawthorns, although he failed to make a League appearance for West Brom and was released. He moved to Carlisle United in May 1973 for what turned out to be a successful five-season stay at Brunton Park, and then made the long move south to Southampton, playing in the season in which Saints finished 6th in the top flight – their highest ever placing. 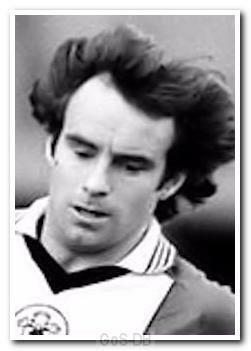 Moving to Home Park in August 1981, the tough-tackling full-back spent two seasons in Green, after which he returned to Cumbria for a second spell with Carlisle United. He added a further 131 games to his career total before moving into non-league football with the then English incarnation of Gretna, as player-manager and then groundsman. He was voted number 49 in the Daily Mail's 'Top 50 of Football's Greatest Hardmen' on-line, in 2001.